First, I must acknowledge that the pictures just don't do this justice. It literally was gone from the serving table in minutes. I should have made 2. Or 3. Ever since Bacon Explosion blew up on the internet in 2008, it's been in my thoughts. It wasn't until this year that I finally got the opportunity to make it. This year I decided to rent a bounce house and have a fat pants birthday party. Bacon explosion was the highlight of the menu, but it also included chips and dips, meats and cheeses, grilled bacon wrapped jalapeno poppers, super cheesy crock pot mac and cheese, Unicorn Poop Cookies, an ice cream sundae bar, and Reese's Stuffed Chocolate Covered Oreos. If this weren't a bacon site, I'd have a lot to talk about. 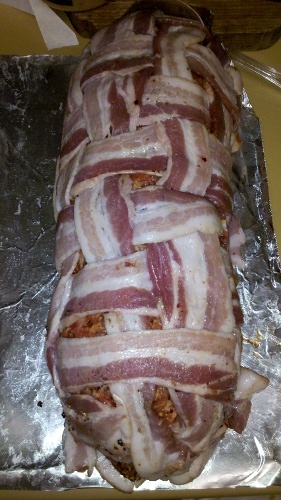 I'll address the bacon wrapped jalapeno poppers later, for now, let's talk Bacon Explosion. I cannot put into words how delicious this was. I actually forgot the very last step because I was so anxious to cut into this delicacy, and it really did not seem to matter. Construction is fairly simple, just be prepared to get your hands dirty. Cook 1 lb of bacon using your preferred method to make sure it's crisp and allow it cool. When it's cool, chop it up. I took a shortcut and used the microwave. I'm on the fence about the results - the bacon was not crispy, and it really didn't seem to make a difference in the end product, but I still wish I would have chosen a different cooking method. Place some foil down on a good sized work space. Channel your inner child and wave the bacon like you would strips of construction paper: lay half of your strips vertically and then weave the remaining strips, one at a time, over under over under. Once your weave is complete, put an even, generous coat of your bbq rub. Roll the inner sausage layer into a log. 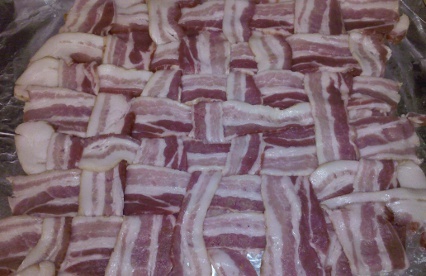 Put your sausage log on one end of your weave and then roll like a sleeping bag to wrap the log in the bacon weave. You want to get a nice tight wrapping for it. Cover in foil. 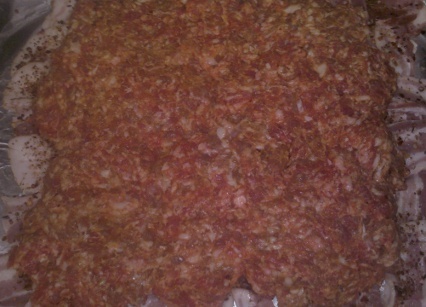 I prepared my Bacon Explosion the night before I planned on cooking it. When you're ready, heat your grill. Once the grill is hot enough, put your wrapped Bacon Explosion in the smoker and cover. Cook it for 2 hours. After 2 hours, I took it off the grill and served it, although that was due more to the fact that I was drunk and forgot to do the final step. The final step is to unwrap the log, cover in bbq sauce, and allow it to get a nice caramelized outer layer. I'm sure it would have been great with it, but it was great without it. No regrets!